The Petzval lens (or Petzval portrait lens) is the oldest notable lens design for photography. It was calculated and designed by the Hungarian mathematician and physicist Jozef Maximilián Petzval, and first used for Voigtländer's early metal camera "Daguerreotyp-Apparat zum Portraitiren" in 1841. 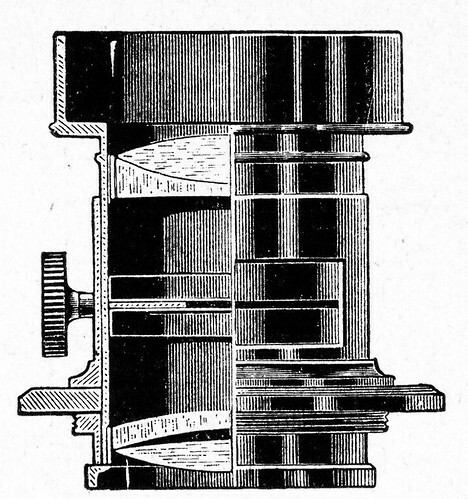 It was the first camera lens made on the basis of scientific calculation, and was the fastest lens of its time, with an aperture of around f3.5 - compared to the typical ~f16 or more of typical contemporary camera lenses. This 4-5 stop improvement could reduce the average Daguerreotype exposure time from around 10 minutes to 30 seconds.